Sergeant Frank Escobedo of the North Division was invited to be a guest on the Today Show along with other officers from around the country talking about police and community relations. This national follows a recent local TV story by Fox 26's Isiah Carey in which he interviewed a diverse group of HPD officers on their thoughts on police/community relations here in Houston. Kyssi Andrews is a little girl battling cancer and was made an honorary officer. She did a traffic stop, and rode a horse and in a helicopter, and the video chronicles her day as an officer. The Telly Awards honors the very best film & video productions, groundbreaking online video content, and outstanding local, regional, and cable TV commercials and programs. 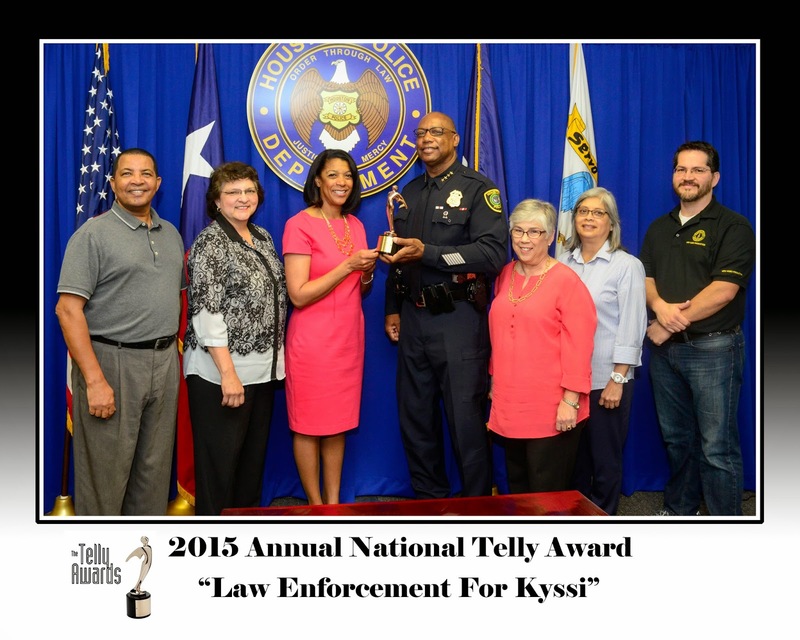 “Law Enforcement for Kyssi” was selected out of almost 12,000 entries from all 50 states and 5 continents. Congratulations to our Video Production Unit. HPD continues to send our thoughts and prayers to Kyssi as she fights! We are behind you, Kyssi! 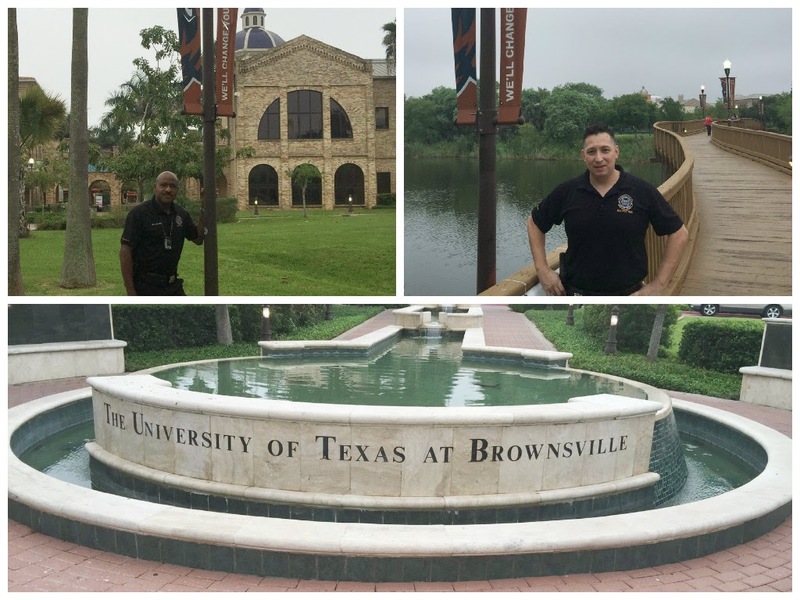 Officers Slade and Conchola were at the University of Texas - Brownsville recruiting for HPD. 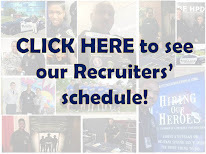 Follow this blog to find out where our Recruiting Officers will be each week. 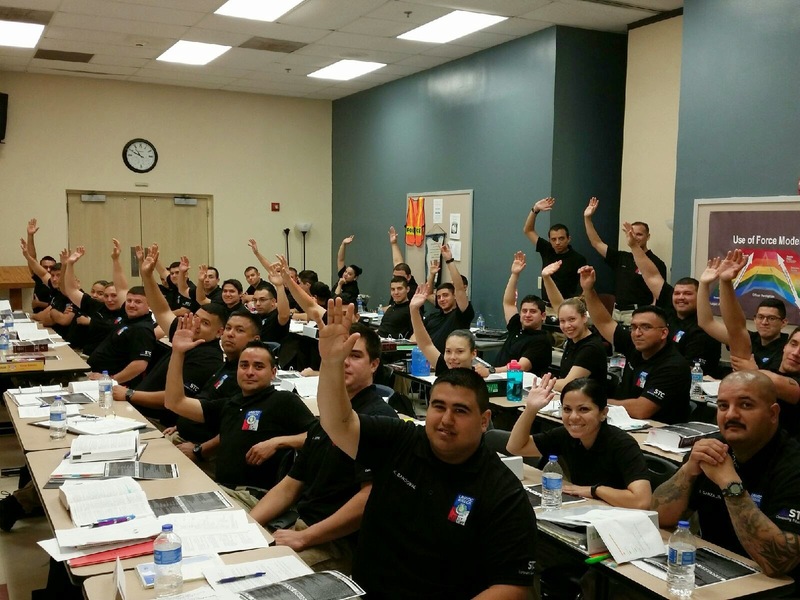 What happens when an HPD Recruiter asks a room of cadets "Who wants to be a Houston Police Officer?" 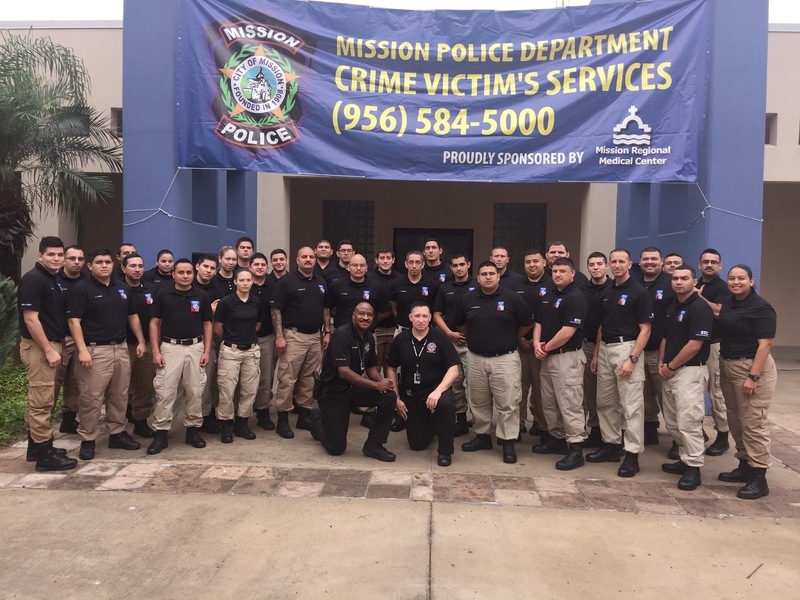 HPD Recruiting Officers Slade and Conchola had a great time speaking to the cadets in Mission, TX. 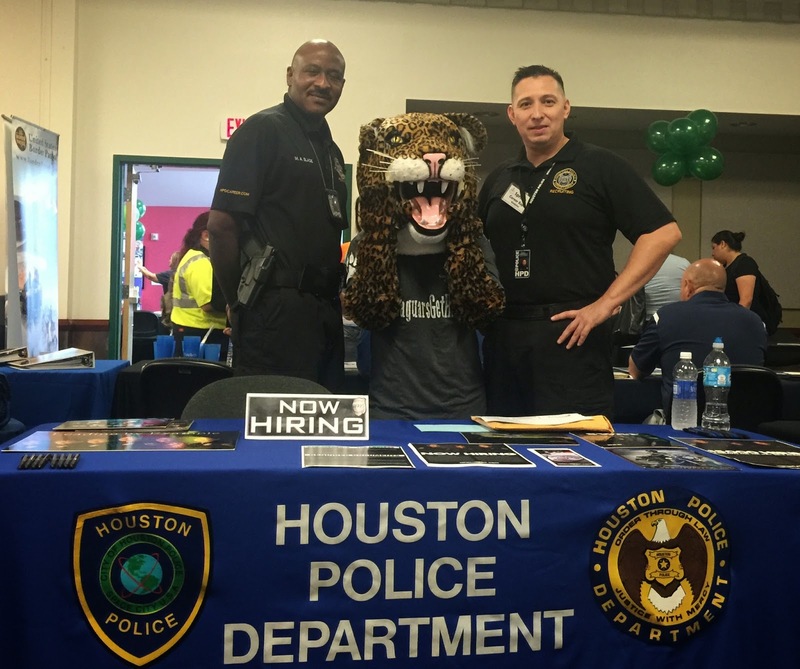 HPD Officers Slade and Conchola posed with South Texas College mascot "Jerry" at the Spring Career Expo today! 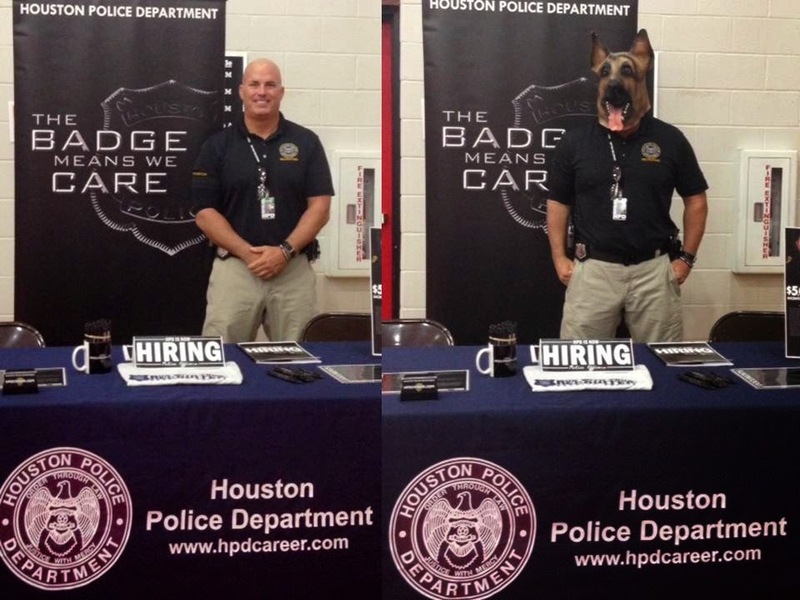 Officer Jones of the Recruiting Division was out at the University of Houston - Downtown today. 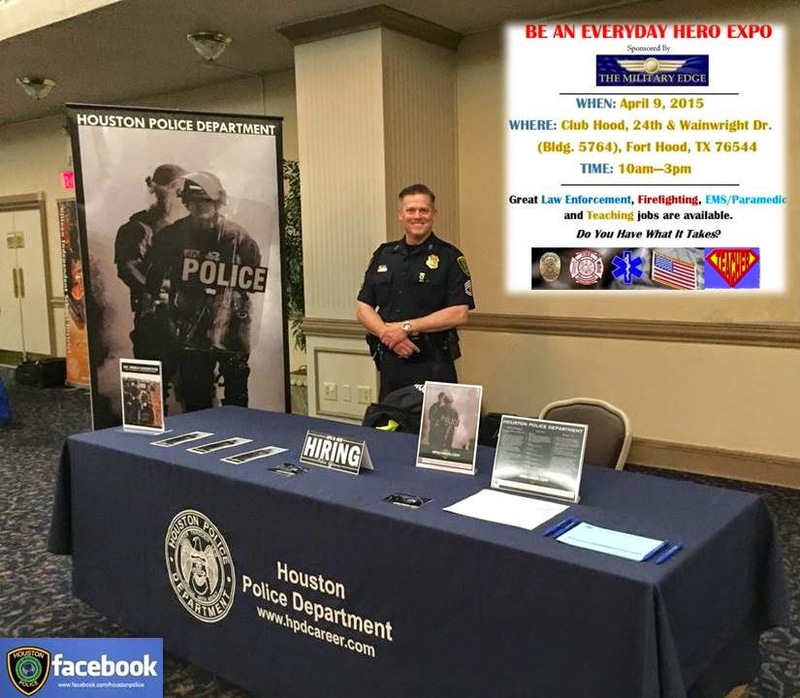 HPD will take part in Missing in Harris County Day on Saturday, April 25, from 10 am - 3 pm at The Community of Faith Church located at 1024 Pinemont Drive in Houston. 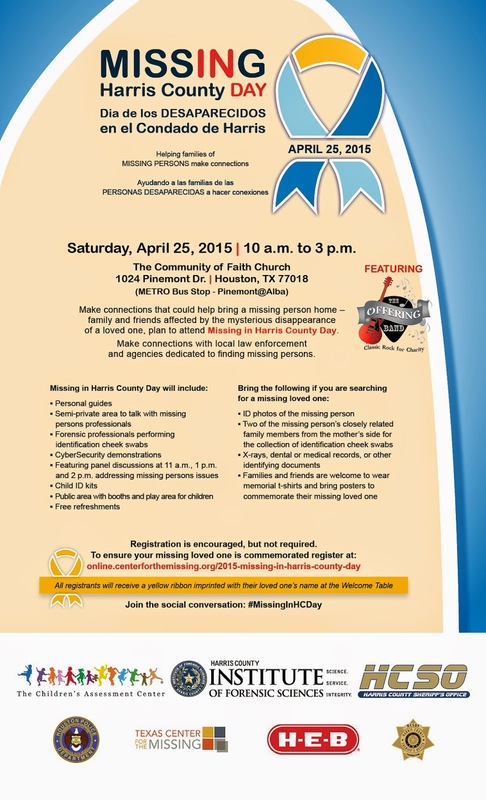 #MissingInHarrisCountyDay is designed to help families and friends with missing loved ones make connections with agencies that can help bring the missing home. The event will feature cyber-security demonstrations, child ID kits, face painting and a series of panel discussions addressing missing persons, search efforts, human trafficking and migrant issues. If you are seeking an missing person, remember to pre-register for the event - we want to make sure we are able to provide you with an informative visit! Great Recruiting Event at Huston-Tillotson University! 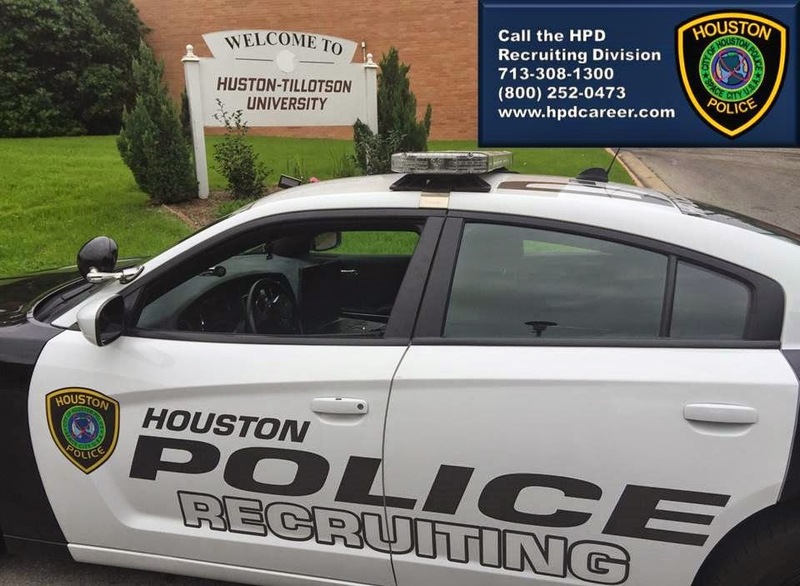 HPD Recruiting will be at Huston-Tillotson University today and tomorrow. Stop by and see how you can start your career with us! Officer Gilmore (or is it?) is out at Hargrave High School's Career and College Expo today! Sgt. 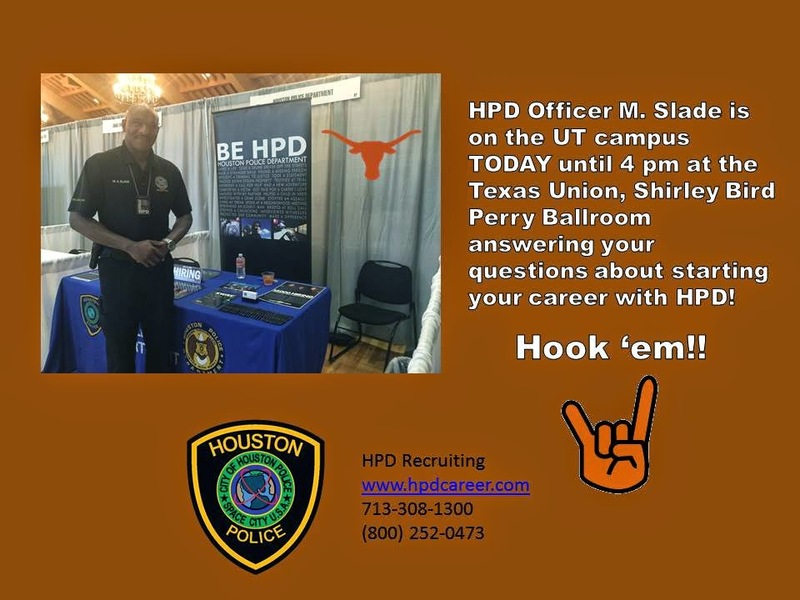 Kiesewetter of the HPD Recruiting Division is at Fort Hood until 3 pm today talking to veterans about starting their career with HPD. 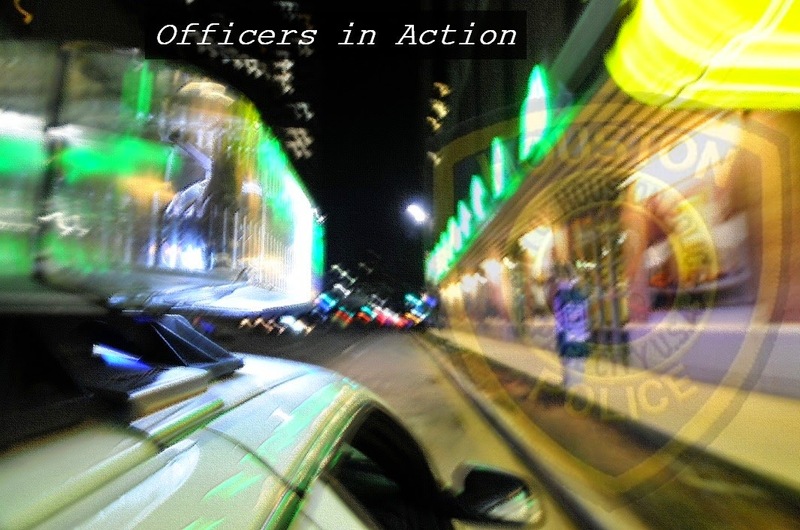 You can follow this blog to see where our recruiters will be each week. Recently, Officers C. Kirk, A. Cotter, and M. Oquendo, all assigned to the Clear Lake Patrol Division, were dispatched to a disturbance call at 10600 Sabo Road. The citizen stated that she was being stalked and harassed by her estranged husband. The suspect had broken the citizen’s window prior to officers arriving. Officers completed a report. Later in the shift, the suspect returned and the citizen called the police again. This time, officers had a description of the suspect and his vehicle and saw him driving away when they arrived. Officers followed the suspect and attempted to conduct a traffic stop, but the suspect refused to pull over and a pursuit began. The suspect evaded until running into a stop sign when he then fled on foot. Officers quickly established a perimeter and were able to arrest the suspect without further incident. Officers discovered that the suspect had numerous prior arrests included felonies. 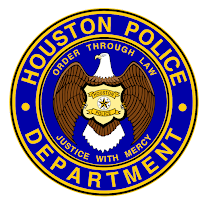 Officers discussed the facts of this case with the Harris County District Attorney’s Officer and the suspect was charged with Felony Evading Arrest and Felony Violation of a Protective Order. The suspect also had an outstanding felony warrant for burglary of a habitation. Due to this outstanding police work, a violent felony suspect was taken off of the streets. Great job!